When I first started writing seriously, I could just about write a complete 50K story, but every chapter was a struggle. The thought of writing 80K or 100K was as daunting as Mount Everest, but slowly I managed to edge up my upper limit. The last story I finished was over 70K, and it didn’t feel too strenuous. At last, I thought I was achieving writing fitness. But now I’m working on a short novella. It’s to be part of an anthology, so I don’t want it to be more than 10-12K. And now I’m finding it’s a lot harder to write less. I’ve written the beginning about four times and it’s still not right. With only 10K to play with, every sentence becomes important. It’s like putting together a very complicated jigsaw. I’m finding I need to cut out some of the action because the external conflict threatens to overwhelm the internal conflict, and without internal conflict there’s no meat to the story. 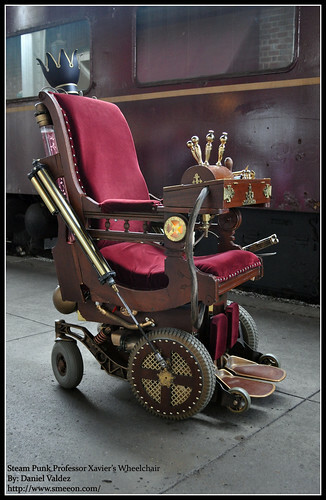 Artist and X-Men fan, Daniel Valdez of Smeeon, created a steampunk wheelchair for the character Professor Charles Xavier. The smokestack even emits steam! 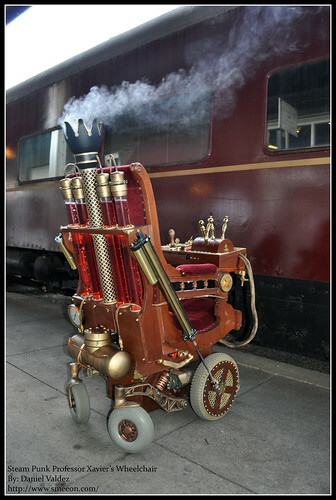 A steampunk wheelchair worthy of any dastardly villain.